PLEASE LET MS.THOMPSON OR MR. MARTIN KNOW IF YOU ARE ABLE TO HELP SUPERVISE ON CONCERT NIGHT OR DURING REHEARSALS IN THE AFTERNOON. The first group performance opportunity of the year is upon us! Here are a few extra notes about the concert process for this coming Thursday (December 13th) and what to expect. With students learning music concepts/new music for just over three months it is important that students know that we expect them only to do their best and contribute what they are capable of. The concert is a safe environment and important as much for the experience they will get from being in a large ensemble and playing in a great concert hall as it is playing all the pieces correctly. It is also important to remember like all other subject’s students learn at a different pace. Combine this with the fact every instrument provides different challenges we encourage the students to contribute and enjoy what they are comfortable and think about the main term one goals in pitch sound/tone quality and being rhythmically accurate above all. All students provided transport to the concert. 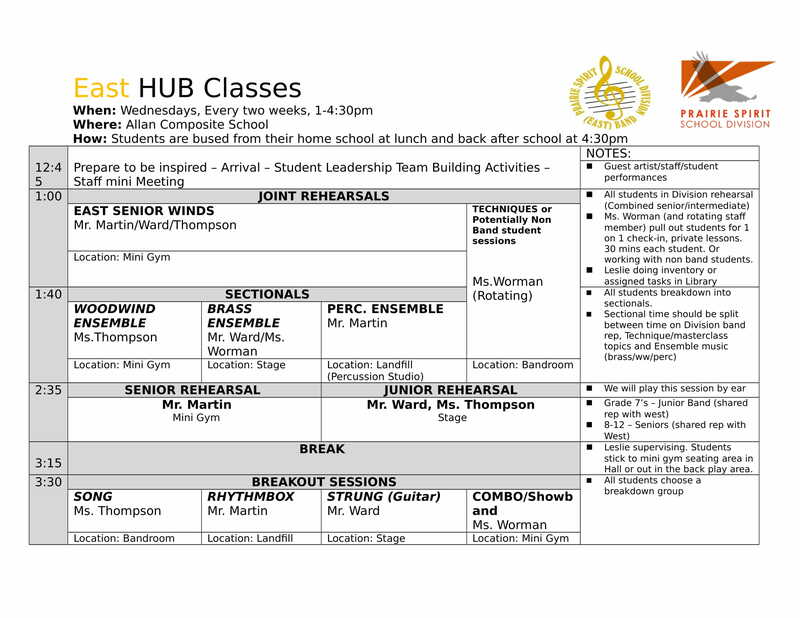 They will catch a special bus after lunch to the concert venue so they can rehearse with the other grade 5/6’s in the East half of the division. All students need to have returned their signed bus form to ride the bus (please let me know if you need a copy). There is no charge for the bus. The do need picking up from the concert to go home. If transporting students home is an issue, please let me know. Carpooling with other students from your community is generally easily arranged. We want as many students to take part and experience the concert as possible. Students have a designated area where they can eat their packed supper and stay until rehearsal or concert time. Students should remember they are representing themselves their school and the division and should act with respect to their environment and people within it at ALL TIMES. The Winter Concert is traditionally a short affair and usually runs around an hour. We ask that all students stay to listen and support the other ensembles in the concert. Students will be sat in their ensemble and have designated spots in the auditorium. Please rehearse and work hard to improve your parts as much as you can from now until Thursday to ensure you are the best you can be. The Winter Celebration is fast approaching. Students will be bussed directly from their homeschool after lunch to Lakeview Church for rehearsals. They will however need taking home after the concert. The Celebration is MANDATORY for Grade 7-12 students, and is OPTIONAL for Grade 5 & 6 students. We will also be doing a bake sale. All Senior Band Students (Grade 7-12) are required to bring two dozen peanut free items. Students in Grade 5 & 6 can also bring items for the bake sale, however it is not mandatory. All proceeds from the bake sale will go towards providing clinicians, offsetting costs, purchasing new instruments, and other student events. What? – Term 1 Performance and Winter Celebration for all Music Students at Lakeview Church. Who? – All music students from Grade 5-12 are invited to participate. The celebration is MANDATORY for Grade 7-12 students, and is OPTIONAL for Grade 5 & 6 Students. Please email Mr. Martin or Ms. Thompson if there are any questions regarding attendance. Grade 5 & 6 : Smart Dress – Wear your best. Grade 7 -12 : Black Pants, Black Socks, Black Shoes, Division Polo Shirt will be provided. We are in desperate need of approximately 10 parent/guardian volunteers to assist with student supervision while Mr. Martin & Ms. Thompson are running rehearsals. Supervision of our students is vital to ensuring student safety, and to ensure our celebration runs smoothly and successfully. Call for Band Parents: If you are interested in becoming involved in our Band Parents Association, please email Ms. Thompson (shelby.thompson@spiritsd.ca). We meet once a month on the first Thursday at 6:30pm at Broadway Roastery on 8th Street. Our next meeting is December 6th. Our Winter Concert and Term 1 celebration creeps ever nearer. This year both the East and West concert will happen within the same night with the East Concert taking place at 5pm. Senior (Grade 7-12) players will perform in both 5pm and 7pm performances. East students will be bussed from their home schools after lunch on Thursday December 13th to Lakeview church to rehearse prior to the 5pm concert. All students will need to be picked up and taken home after the performance. 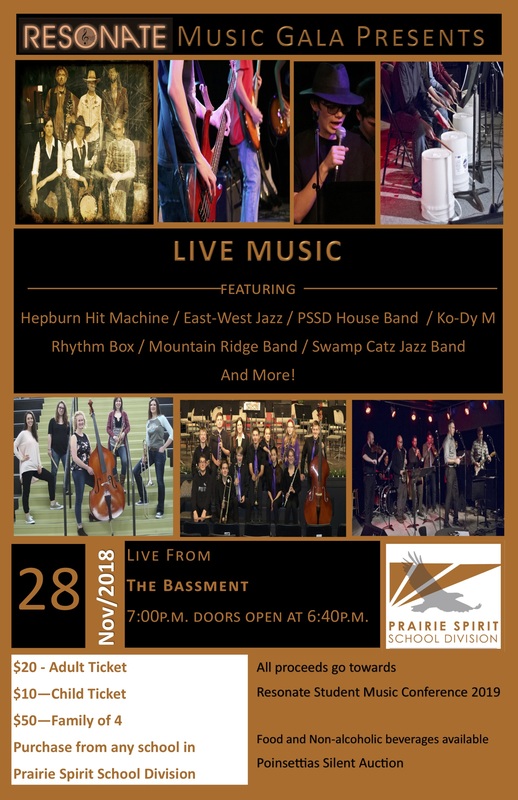 West Grade 5 (Beginners), West Junior Band (Grade 6/7), East and West Senior Winds (Combined Band), Brass Ensemble (East/West) Song and Woodwind Ensemble. Jazz Band. We are in desperate need of parent volunteers to help supervise before the performances. Please let us know if you can help out for the evening.